A startling (if you are a fan of the Queen Betsy series) change from other titles from Davidson – Deja Who and the Insighter series are complex and initially confusing : the main character Leah Nazir is an “insighter” – in short – she can see people and ALL of their past lives – and the influences, corrections (or not) and current issues that relate to them. Honestly, the concept is wonderful and complex: we’ve all met that ‘person’ who can’t let go of a childhood issue – how bad would it be to have 5 or 10 lives lived that ALL brought those problems in? Of course Leah has difficulty getting ‘close’ to others, and while her skills are respected and she’s frequently called to help people resolve past life issues that are bleeding into their current behaviors – it’s not all a bed of roses. She sees the worst of humanity and it’s impulses: faces more than a handful of dangers, and truly, while she can ‘close off’ the need to read people, it’s always there – waiting to pounce. And, she’s got her own issues going on – her own past lives and her relationship with her more than difficult mother, and changing the course of a death that she lived in a previous life. That’s not much -right? Well, Davidson has provided a series of notes that are a “must pay attention to” series of explanations that will help you to come at Leah’s story with the basics – so her own experiences won’t seem quite so strange. But, we dive right in and Leah is in a ‘session’ helping others work through their unresolved issues from their past lives and it could simply be the intro to a bad joke: A Pirate, a Serial Killer and a former Supreme Court Justice renown for his bigotry and distasteful views are in a session with Leah, working on their ‘issues”. (See – told you it read like a joke intro) which is, sadly just another ‘workday’ for Leah. And this is where it all starts – getting the sense of what she can see and do, what her ‘job’ is, and how she can change her own current life to not be yet another murder victim – as all of her past lives were. Enter Archer – a PI hired to keep an eye on Leah by her mother (who is hoping to bring Leah back to do her bidding) because Leah is ‘in danger” and doesn’t know, is uncomfortable with his ‘mission’ once he sees that she’s intriguing to him, and the whole fact that (he believes) she doesn’t know that there is someone out to hurt her . So, being the person he is, he decides to tell this intriguing girl what he knows – and is stabbed for his troubles. See – Leah can’t read any past lives in Archer -and that’s not only rare but something she can’t help but find relaxing, when it’s not scaring the life out of her. She knows she’s to be murdered as she’s not unlocked that trajectory in her own history, yet., and Archer could be her murderer. He’s not -and truly likes her – and would like to build a life with her – but they have to determine who the killer is and stop them before their lives can really begin. Now the fun begins – and we get to see Leah and Archer as they work together and at cross purposes, meet more of Leah’s clients and see the effects and hangovers from past lives, get some insight and straight-talk from a homeless woman in the park, and start to unravel the complex and knotted relationship that lies between Leah and her mother. Twists, turns and a solidly quirky romance that couldn’t be anything but, the story is engaging and engrossing – demanding you pay attention and enjoy the ride. Narration for this story is provided by Nancy Wu and she presented the story crisply and cleanly – a must for the ‘introduction’ to the reincarnation theories and explanation of Insighter history, while allowing the slight cynical tone of Lean, and the giant puppy-like encouragement and ‘feel good’ utterances from Archer (Hey, you’re here and didn’t get murdered last night – YAY) that are so inappropriate yet laughable as they drill right into the heart of the situation. Subtle changes in tone and delivery gave added weight to moments that explain or will come to be more important, as well as distinguishing characters and providing a sense of intent – not overtly flagging the ‘bad guys’ up the pole, but giving a touch of malice of disquiet when they appear. This isn’t a tory that relies heavily on world-building as it is contemporary and could be the city next to you, but it is the abilities and influences as the paths of reincarnation are traveled and explored that add a ‘newness’ to the story and entice the imagination. 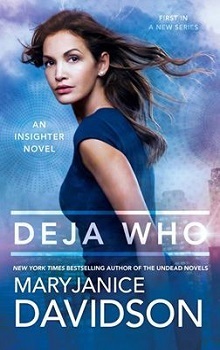 No one builds a character like MJD can – with their crazy and intricate backstories, a self-awareness that is as sharp as it is funny while creating an empathy for them, making them someone you want to know and befriend. Grab this if you want something totally different, and DO NOT forget to pay attention to the author notes – they’ll help you to fit all of the pieces together. MaryJanice Davidson is a former model and medical test subject, as well as a New York Times best-selling author who has no idea why she is a success at what she does. ("No idea. At all.") Her books have been translated into several languages and are available in 15 countries ("No one is more surprised than I."). She frequently speaks to book clubs ("I don't know why my books sell. "), writer's groups ("I don't know why I'm on best-seller lists. "), and World War Two veterans ("Thanks for driving Hitler to suicide!"). She lives with husband, family, and dogs in St. Paul, MN, and loves ("No, really...I do!") hearing from readers.